Lovely Lattice Sale-A-Bration Stamp Set from Stampin’ Up! 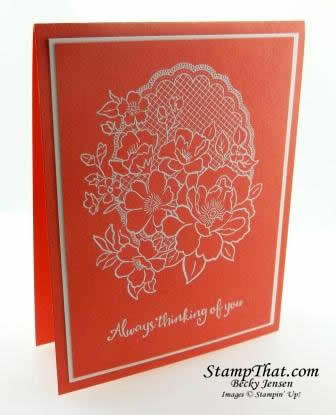 I want to get some time to sit down with the Lovely Lattice stamp set and color the flowers one of these days. In the meantime, it’s nice that this set doesn’t have to be colored. I can make a simple, no-coloring card with this set that is still lovely. This stamp set is one of our free options with a $50 purchase during Sale-a-Bration! Here is a card we made in the All Occasion Card class last month. It’s so nice to be able to make a nice card whether you have the time to color or not! I hope you have had a great weekend! I know I had a great time at Linda’s stampin’ party this weekend! We had some great projects, yummy food, and a great time laughing together! I look forward to seeing people in classes for Valentines Treats, Stamp of the Month, Scrap Club pages, and Valentine Gifts this week!